Eheim Classic series (includes 150/250/350/600) canister filters are one of the most powerful and quietest canister filters in the market today. 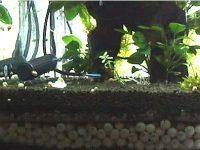 They are great choices for medium to large aquariums up to 160 gallons. 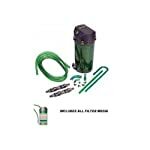 These filters are in the classic series, which means it has been on the market for years and has been praised as one of the most effective, quiet, and durable canisters available. In this review, I will outline some powerful features of these powerful filters so that you can know if they are relevant for you or not. These canister filters are in the classic series, they have been on the market for years and have been praised as one of the most effective, quiet and durable filters. They have been known to run for many years without issue, and require only infrequent maintenance which means that owning and operating one is a breeze. 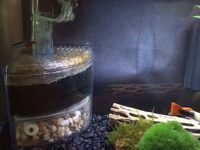 They are perfect filters for both saltwater or freshwater applications, and come with all necessary hardware to set up your filtration system properly. A little mess in maintenance because they don’t come with media trays like other canister filter brands. Eheim Classic series canister filters come with one round filter chamber where you can place your own filter media to perform the best filtration as you want. Besides, the products also come with some filter media ready for the setup that are the most advanced filter media from Eheim today. The mechanical filtration is performed by Eheim Mech pre-filtering media and round filter pads, which are specially designed for these round canisters. Eheim Mech pre-filtering media help to trap large dirt particles into the bottom and keep the water clean. These particles can then be removed by maintenance, and the Eheim Mech pre-filtering media can easily be cleaned and reuse many times. The biological filtration is fulfilled by Substrat Pro that plays a role like Ceramite rings (biological filter media) in other filters and is even better. Being made of artificial sintered glass material, Substrat Pro filter media contain a huge amounts of internal tiny pores which provide the best house for helpful nitrifying bacteria to colonize. The Substrat Pro media included in the package are plenty that means the biological filtration is best performed to protect your fish from ammonia and nitrite toxins. The chemical stage of Eheim Classic series is done by a Carbon filter pad, which excellently remove impurities, discoloration and harmful toxins to protect your aquarium pets. You can also use activated carbon to replace the carbon filter pad if you want. Unlike other canister filters with media trays, Eheim Classic series canister filters come with only one round filter canister. 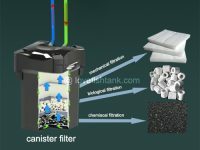 The design makes these filters capable of accommodating a large amount of filter media without any redundant space for brackets like other canister filters. 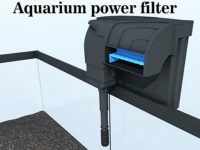 So the filters well perform all 3 types of filtration that keep aquarium water clean, clear and ideal for its inhabitants. The Eheim Classic 150/250/350/600 canister filters are designed with a long-lasting motor impeller (water pump) included in the lid. 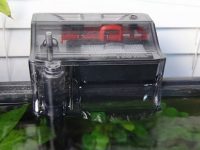 The pump of Eheim Classic series is the best thing which is loved by many aquarists on the world. It consumes very low energy, operates so quietly, and can last for a very long time. The flow rate produced is high enough to keep the water circulated and filtered. There are control valves on the intake and output hoses for you to adjust the flow rate to meet your aquarium need. A spray bar is also included to make the water output gentle and more comfortable for small fish. Eheim Classic 150/250/350/600 canister filters are designed for easy setup and maintenance. The lid is held on the canister by five clocking clips that can be opened easily by your hands without the need of using any special tools. Therefore, it is very easy for you to disassemble the lid to access the internal canister for the setup and maintenance. Don’t worry about the water leakage from the filter after maintenance times because there is a sealing ring inserted in the contact space between the lid and the canister to prevent the water from leakage. 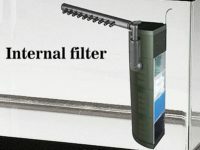 Because of this design without brackets for containing and separating different filter media types, it may be have some mess in cleaning the filter. For easy maintenance without mess, you should use some filter bags for separating filter media in different types. The filter also comes with some lattice screens for separating different media types. By using these separating screens with some filter bags properly, you can make the maintenance a lot easier. The main disadvantage of the Eheim Classic series is that it doesn’t come with a priming button for automatically prime the filter. However, you can easily prime the filter by yourself. 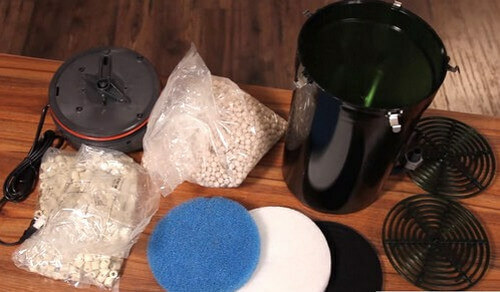 Following is a great video about how to prime an Eheim Classic canister filter. 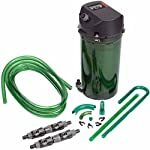 All you need for setting up the filter is included in the package and you only have to fulfill the installation.